Sara performed on Show 324 in New York, NY, on May 24, 2016. 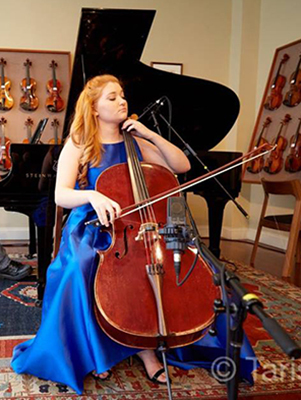 Sara Scanlon (cello), 16, is from Milford, New York, and is homeschooled through the Keystone National High School. She studies cello with Clara Kim in the Juilliard Pre-College Division. Outside of music she enjoys ballroom dancing, sailing, and playing with her pet bunny.